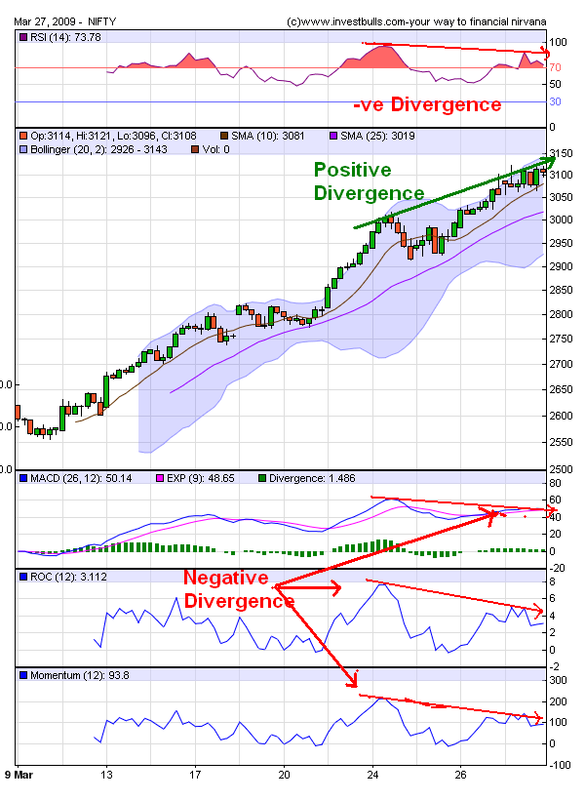 When the prices are making Higher high but the indicators like MACD,ROC, RSI, Stocastics are Lower High when compared to the previous high then there is a formation of negative divergence. Which could possibly lack of momentum and interest the market following by profit booking. Price can be defined as the aggregate value of all participants in a market as they express their hopes, desires, fears, and other considerations as they establish positions (whether as hedged positions or outright directional positions). Momentum can be defined as the speed or force of prices traveling in a given direction. Thus, price may be moving higher, but doing so at decreased speed or decreased force (or urgency). If this situation develops, we would consider this to be a ‘momentum divergence,’ in that momentum is registering an opposite reading to price direction. One may also think of it as throwing a ball into the air. As the ball reaches the apex (the highest point), the ball slows down its speed accordingly before stopping and then reversing… slowly traveling down at first but then gathering speed as it heads closer to the ground. Nifty Hourly chart shows such a Negative Momentum divergence in MACD,ROC,RSI but the prices are making higher high(+ve divergence). Possibly profit booking could affect the street in short term. Target comes around the lower band of the bollinger band 2960-2940 levels.